DE WIT - Ducatus Lutzenburgici Tabula Nuperrime In Lucem Edita Per Fredericum De Wit. DE WIT, F. - Ducatus Lutzenburgici Tabula Nuperrime In Lucem Edita Per Fredericum De Wit. Ducatus Lutzenburgici Tabula Nuperrime In Lucem Edita Per Fredericum De Wit. 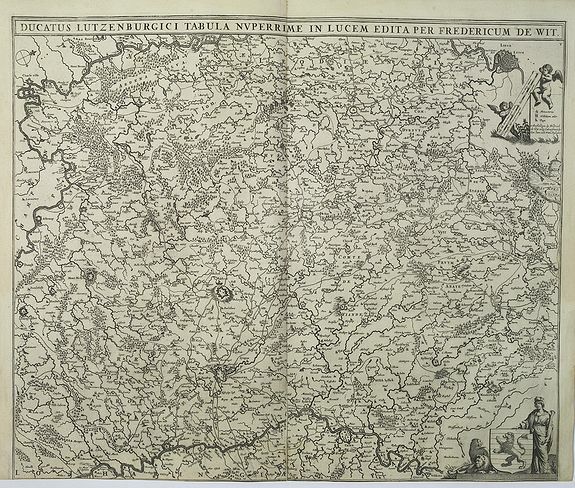 - DE WIT, F.
Title : Ducatus Lutzenburgici Tabula Nuperrime In Lucem Edita Per Fredericum De Wit..
Map maker : DE WIT, F.. Size : 17.9 x 21.9 inches. / 45.5 x 55.5 cm. Description :Popular map of Luxembourg, however this edition has the number "V" in the upper right corner. Condition : A dark and good impression. Lower margin cut till neat line. Split lower part center fold, 8cm. into engraved area, contemp. underlaid.